Bowflex Max Trainer vs. ProForm SMART HIIT Trainers | Which is Better? Side-by-Side Comparison: Which Vertical Elliptical is Best for You? 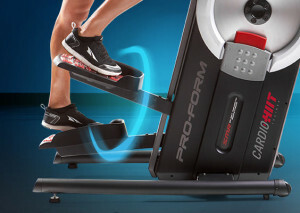 Let’s take a closer look at the Bowflex Max Trainers and ProForm SMART HIIT Trainers (formerly known as the CardioHIIT Trainers or plain HIIT Trainers.) Both machines use a vertical elliptical / stair-climber motion to allow the user to burn more calories in less time. There are some significant differences between the models that might help you choose which will work best for your body and budget. 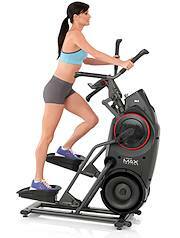 Space Saving Design – Both of these machines are much smaller than typical ellipticals. In fact, they take up about ½ of space and are perfect options for smaller homes or offices. HIIT Training Platform – The marketing draw for the Max Trainers and SMART HIIT Trainers is that they offer very high intensity interval workouts that can deliver major results with minimal time commitments. Bowflex even states that only a fourteen minute workout three times a week will be enough for jaw-dropping results. We are skeptical of this particular claim and recognize that diet and lifestyle are going to play a huge role in the results you see. Still, you can’t deny that HIIT (high intensity interval training) is used by top athletes and provides real results! Easy to Mount/Dismount – Both of these machines are easy to mount and dismount especially compared to rear-drive ellipticals. There is no need to step over any part of the machine mechanics. Upper Body Workout – Both machines have multi-grip handlebars that allow you to get a great workout on your upper body, core and back muscles along with your lower body. Ways They Differ: Who Wins Each Category? 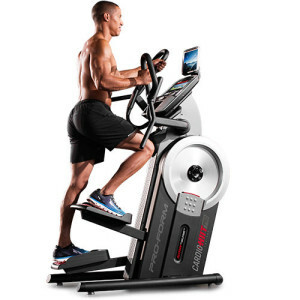 Elliptical Pattern – The pattern on the Bowflex models is like an upright oval. It feels a bit like pedaling on a bicycle while standing up. In contrast, the pattern on the ProForm model is a bit more up-and-down with a 10” vertical and only 5” horizontal path. Resistance System – The following levels of resistance are included on each model: Max Trainer M7 (20 levels), M5 (16 levels), M3 (8 levels), SMART HIIT Trainer Pro (26 levels), and SMART HIIT Trainer (24 levels). Winner – ProForm has way more resistance levels! Fitness Tracking – The ProForm machines have iFit Live which allows you to run virtual courses synced to GoogleMaps, set your goals, and track your results online. You can customize your own fitness programs and keep track of four different user profiles on each machine. The downside to iFit is that it requires an annual subscription. A 2-year membership costs around $216, 1-year is around $144, and lifetime membership is $599. This ongoing cost needs to be factored into the machine’s price. NOTE: You can get your first year of iFit membership for FREE with your purchase. The SMART HIIT Trainer Pro lets you use these features directly on your machine console while the basic SMART HIIT Trainer requires you to link your own smart device via Bluetooth. The Bowflex machines can connect to a free Max Trainer App that lets you link to your existing fitness apps like MapMyFitness, GoogleFit, or Apple Health. The app automatically tracks and stores each workout session. Again, you can link the smart device via Bluetooth. The iFit Live likely provides more benefits but the cost makes us view this category as a tie. ProForm HIIT Trainer – *BEST BUY – Read our full review here. Winner- ProForm has many more programs! Machine Stability – The Bowflex machines weight 143 lbs. (tested for users up to 300 lbs.) and the ProForm machines weigh 180 lbs. (tested for users up to 350 lbs. ), so the ProForm machines have a slight edge on stability. A Bowflex representative said that if you do experience any sort of wobbling on their Max Trainers, it is likely that the feet or levelers need to be adjusted. Winner – ProForm is a heavier machine that offers higher stability. Flywheel / Braking System – The Bowflex Max Trainer machines do not have listed flywheel weights and use classic eddy current braking systems. In contrast, the ProForm HIIT Trainer and Trainer Pro have effective flywheel weights of 28 lbs. and 30 lbs. respectively. The ProForm machines use patented Silent Magnetic Resistance systems for a smoother ride. 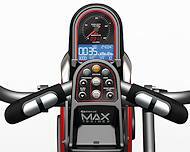 Max Trainer console – Read our full review here. Winner – ProForm SMART HIIT Trainer Pro has a 10” Color Touchscreen for around $1,499! However, if you are considering the SMART HIIT Trainer (only 7” backlit LCD) vs. a Bowflex, then we’d say that the Bowflex has a slight edge with its dual LCD/LED display. Tablet Holder – All of these models have tablet holders, although we should mention one thing with the Bowflex models. The M3 and M5 have a tablet holder that blocks part of the display. On the M7, the tablet location was moved so it doesn’t block any of the display features. Winner – ProForm offers longer warranties. ProForm HIIT Trainer Pro – Read our full review here. Winner – At first glance, the ProForm looks like a better deal, but remember that their iFit program requires an annual subscription. Comparing the M3 and M5, we are going to declare Bowflex the winners on price. The price on the M7 is less attractive to us considering you can get a 10” touchscreen on the ProForm machine for $700 less. High Customer Ratings – The Bowflex Max Trainers have a long history of very high customer satisfaction. This says a lot about the quality of the products. The customer service department is excellent and will take any time necessary to answer questions that you have about the product. For comparison, the ProForm SMART HIIT Trainers were only released on fall of 2016, so there is less of a review history to draw from. We have found a few reviews sprinkled throughout the Internet and they have been very positive. Winner – Bowflex has a longer history of customer satisfaction. We’ll watch ProForm carefully to see how customers like the SMART HIIT Trainers! These machines are very similar and directed at the same market. In fact, the SMART HIIT Trainers were developed specifically to compete with the Max Trainers. Let us know in the comments section below what you decide about each machine. Time will tell which one is better received by the public. Does anyone have either? I am still trying to decide and see advantages to both. I can’t find anything on measurement of the oval pattern of Bowflex (I think this can decide your leg workout advantages). I also can’t find any info on what programs are on each. I know Proform has more, but are they useful and how many are HIIT programs. Just so I understand. Do I have to purchase the IFit subscription to use the ProForm HIIT? Are there programs loaded I can use? If I have to purchase a subscription I will not buy a ProForm. 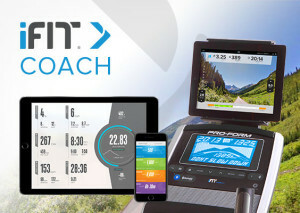 The iFit subscription is not required for the Proform HIIT Trainer. I am interested in finding out more information on the Proform trainers. I have seen / tried out a Bowflex M5 unit at Dicks Sporting Goods, however, I can’t seem to find a dealer who has the Proform HIIT Trainer and / or Pro Trainer equipment for me to view and or try. On line, it lists Sears and Dicks as being two retailers that sell the Proform product, though I have been to both places and they don’t carry the HIIT Trainers. Please help! And thanks for answering the question on the not needing the iFit subscription to use the trainer. However, how will my experience using the Proform trainer(s) be different IF I choose to get the subscription as opposed to IF I use the trainer w/o getting the subscription? RESPONSE: you will not have the same experience using the trainer without the iFIT feature. Lastly, I left a request for someone to contact me on the Proform site yesterday and never rec’d a call back….:(. I do like the thought of having a machine that makes less noise than the Bowflex trainer. We’ve had a lot of folks purchasing the Proform machine with positive feedback. Does the iFit program come with a trial? Does the ProForm come with a chest strap like the max trainer does? NordicTrack started requiring IFit live one year purchase with their machines recently. It’s actually a great program (and worth the money) but a nuisance they “force” you to purchase it at the time of check out. There are a few models they have included it with as a problem but none at the moment.